San Diego State University’s Historic District is an important and unique representation of evolving twentieth-century educational philosophies, architecture, and the significant accomplishments of the Works Progress Administration (WPA) in Southern California. The district’s plan, layout, and design are directly associated with the goals of the early leaders of this institution who sought to move its educational philosophy from that of a curriculum based on rote memorization and drill to a more holistic approach of educating and developing the complete person’s mind and body. Under the direction of these visionary presidents, San Diego Teachers College developed into a comprehensive modern university with the Historic District as its core, and this district remains the symbolic center of San Diego State University today. What is today San Diego State University began as the San Diego Normal School, established in 1897 to provide local education for future female elementary school teachers (Starr 1995:18). The term originated in eighteenth-century France from the École Normale Supérieure (“Normal Superior School”), established in Paris in 1794 as a model for teacher training schools. Although the state legislatures both established schools and controlled their number and placement, the organization, curriculum, and management of the schools depended upon local needs. Thus, the presidents of the normal schools were highly varied and had a marked personal influence (Harper 1939:103). Some traditionalists argued that teachers only needed to learn those topics that would “normally” be taught in an elementary school. However, this attitude was not shared by Dr. Edward L. Hardy, the second President of what was then San Diego Normal School. 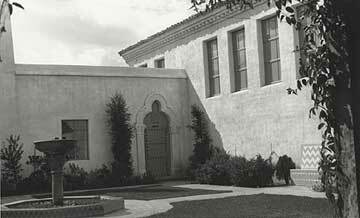 During his 25 years in office, the institution evolved into the San Diego State Teachers College in 1923, and then the San Diego State College in 1935 (Starr 1995:91). Hardy’s vision “lifted the normal school from a narrow training in pedagogical methods and teaching skills to a concept of broad professional preparation and academic enrichment for the teacher" (Lesley 1947:22). A progressive educator and administrator, Hardy influenced higher education throughout California and was instrumental in raising the standard of the profession of teaching during the early 20th century (Love 1955:52). Hardy’s views regarding the nature of education showed the influence of the Herbartian education movement, which held that the traditional method of teaching through rote, memory, and drill was not effective. Herbartian education preached the doctrine of interest: students should be interested in the subject and also develop interests (Harper 1939:127). Hardy was also a strong advocate of women's abilities long before this was a popular sentiment. He recognized that those professions usually filled by men such as engineer, lawyer, and minister required more than two years of college education. Teachers’ training, however, was limited to the basics and seen as a "preparation for spinsterhood" (Lesley 1947:24). The business of professional preparation for teachers was solely in the hands of the normal schools, as existing universities and colleges often felt that such training diminished the true work of the university. Hardy felt the need to expand the educational opportunities for teachers, and developed curricula to accomplish this (Lesley 1947; Starr 1995). Following these designs, Hardy forwarded the inclusion of the laboratory phase of teacher education, which was adopted at San Diego Normal School. Advocates of such laboratory or practice schools felt that normal schools should duplicate as closely as possible those conditions that a teacher would encounter in the field. This would also allow model and experimental schools to demonstrate new and better teaching techniques. Hardy assured the continuation of the laboratory method by designating a Teacher Training building in the new college design (Lesley 1947:24-25). Along with the laboratory phase, Hardy believed that many extra curricular activities should be incorporated as an official part of the development of teachers. Normal schools pioneered the incorporation of drama, music, and physical education activities into curricula (Harper 1939:119). Future construction of the Little Theater as well as the Gymnasium, Aztec Stadium, and Greek Bowl assured that drama, music and sports would be part of the new campus’s curriculum at San Diego State Teacher’s College (Lesley 1947:25-26). The years 1921 to 1935 were marked by great change at San Diego State Teachers College; it was during this time that President Hardy's vision and philosophy came to fruition. The enrollment increased from 600 students in 1921 to 1,300 in 1925, consistent with the overall growth in college enrollment nationwide (Lesley 1947:40-41). Due to this increase, the state granted San Diego State Teachers College status as a four-year institution in 1923. Since the 25-year-old University Heights campus would not be able to sustain a larger student population, Hardy began planning for a new and larger school to accommodate the increase in students. He envisioned the New San Diego State Teachers College campus as a “harmonious expression of learning and architecture” with allegorical architectural links to “historic institutions of civilization and enlightenment” (Hardy 1929:1). On April 6, 1928, the Citizen’s Executive Committee chose to locate the new campus in the center of a 125-acre site in the heart of the newly subdivided Mission Palisades tract in San Diego (Bevil 1995:41). One of several potential locations, the Mission Palisades or “Bell-Lloyd” site was a gift from Los Angeles oil tycoon Alphonzo E. Bell, through the aegis of his Bell-Lloyd Investment Company (Bevil 1995:42). Located approximately seven miles due east of the old University Heights campus, the new site’s advantages included a level building area, two arroyos suitable for construction of an athletic stadium and amphitheater, an unobstructed view of the surrounding area, and room for expansion. The Bell-Lloyd Company contributed the services of its landscape architect and urban planner, Mark Daniels, and $50,000 to the campus building fund for grounds improvement (Bevil 1995:42). The following May, the voters of San Diego approved a bond issue to purchase the old Normal School site. Students, faculty, and distinguished visitors attended the October 7, 1929 groundbreaking ceremonies, which included speeches, live music, and a ceremonial flag-raising (Starr 1995:73). Two years later, the first classes were held on February 9, 1931, and the first graduating class numbered about 90. Although far from complete, the new campus’ landscaping and architectural embellishment indicated that San Diego State Teacher’s College would be “one of the most beautiful of the Pacific Coast colleges” (Bevil 1995:43-44; Lesley 1947:48-9). All of this would become the nucleus of the present historic district (Figure 3.1). 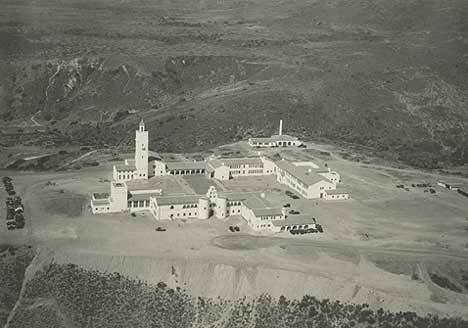 Figure 3.1 Aerial view of San Diego State Teacher’s College taken in 1931. Courtesy of San Diego State University Library, University Archives, Photograph Collection. Both the physical size and the reputation of San Diego State Teacher’s College grew during these years. Evidence of its stature among colleges can be seen in two 1934 events which took place at the new campus. The San Diego State student body president was host to all student body presidents of colleges west of the Rocky Mountains, the first time this enclave had been held at a State college (Lesley 1947:55). In November of 1934, the International Relations Club was host to the Third Annual Pacific-Southwest International Relations Club conference. Speakers included a member of the Carnegie Institute and a former president of Mexico (Lesley 1947:56). Under Hardy's leadership, San Diego State Teachers College had gained the recognition, prestige, and professionalism he always felt it deserved. In 1935 the California State Legislature dropped the term "Teacher" from the title of the State colleges, and San Diego State College was born (Lesley 1947:56). In addition to the name change, the legislature encouraged colleges to add liberal arts classes to their curricula. With this as the culmination of his life's work, President Hardy retired from San Diego State (Lesley 1947:57; Starr 1995:91). Dr. Walter R. Hepner was the third president of San Diego State College. Under Hepner’s administration (1935-1952), San Diego State became a full-fledged academic institution. In 1935 the California State Legislature authorized the expansion of the college through offering degree programs other than teacher preparation (Lesley 1947:57). Hepner believed that San Diego State College should do more than prepare its graduates for employment; he stressed that a good liberal arts background was necessary preparation for success in life (Starr 1995:92). Student enrollment increased dramatically during Hepner's administration, and in order to meet the demand of increasing campus population, it was necessary to plan for the future expansion of the campus (Starr 1995). During his tenure, Hepner was responsible for coordinating the building of eight new buildings, building extensions, and adding acreage to the original campus with the help of WPA workers (Figure 3.2). 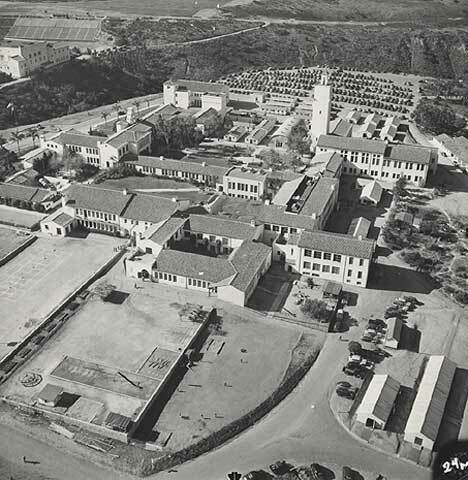 Figure 3.2 A view of the expanded campus in 1948. Courtesy of San Diego State University Library, University Archives, Photograph Collection. Hepner also coordinated the preparation of the campus educational programs to meet the wartime demands during World War II. During this time, over 114 acres were added to the campus (Bevil 1995: 57). Constructed over a period of thirteen years from 1930 until 1943, the historic campus core buildings and grounds represent the evolution of the Spanish Colonial style in Southern California. Their historic design and layout are linked directly to the visionary mindset and educational philosophy of President Hardy, which he detailed in popular magazines of the time (Hardy 1930). Hardy explained in that the style of a building affects one’s feeling toward life, noting that “civilization is a . . . social work of art, expressed in social action, like a ritual, or a play (Hardy 1929:3). Overall, Hardy insisted that “the new State College of San Diego [be designed] in architecture reminiscent of Spain . . ., influenced by the Arabian and Moorish . . . in a landscaping very like that of southern Spain” (Hardy 1929:3). Two interrelated architectural styles—Mission Revival and Spanish Colonial Revival—were extremely popular in California and throughout the United States between the two world wars. Using these styles, California’s predominant white middle-class society sought to establish a uniquely Californian architectural identity during the early part of the 20th century. However, instead of creating a truly original style, they focused on reinventing a romanticized version of its Hispanic past (Bevil 1995:44). The first attempts at rediscovering California’s architectural Hispanic past—the Mission Revival Style (1890-1915) —was the first phase of the Spanish Colonial Revival (Gebhard 1997). It drew upon original late 18th to early 19th-century Spanish Mission architecture, using design and construction features dating back to the beginnings of Spanish vernacular architecture. Some of its most distinctive architectural characteristics included massive, unadorned, whitewashed walls constructed of sun-fired adobe bricks, roofs of red, fired clay tiles with overhanging eaves, and floors of red square tiles (Bevil 1992). Other unique architectural features commonly associated with Southern California missions include a built-in or free-standing campanario, or pierced wall bell tower, a curving ornamental false front, and one or more arcaded walks. Patios with fountains were also common (Gebhard 1967, Weitze 1984). The Spanish Colonial Revival style developed concurrently with the Mission Revival style. Although incorporating design features found in the Spanish missions, its promoters also looked toward Moorish, Italian, and Pueblo Indian antecedents for architectural inspiration. Also known as the Spanish Eclectic or Mediterranean Revival, its characteistics include a combination of details from several eras of Spanish, Mexican, and Southwestern territorial United States architecture (Gebhard 1997). Similar to the Mission Revival, the style featured roofs covered with barrel-shaped Mission or S-shaped “Spanish” fired clay tiles. Doors and doorways contained dramatic carved wood door panels and molded concrete or art stone spiral columns and pilasters, carved stonework, and geometrically patterned colored faience tiles. Window openings were either multi-arched or parabolic, employing grills of wood, iron, or concrete. Other details typically included whimsical tile-roofed chimney tops, brick or tile vents, mosaic tile-covered fountains, arcaded walkways, and round or square towers (Requa 1926; McAlester 1984:418). The San Diego State College Historic District is a singular and outstanding example of Spanish Colonial Revival architecture in an institutional setting. Relatively intact to this day, the core buildings are invaluable sources for studying the most desirable elements of the Spanish Colonial Revival architectural style adapted to a Southern California college campus. The historic core campus buildings express one of the style’s best features: restraint and sophistication. The buildings represent sculptural volumes that are “closely attached to the land, whereby the basic form of the building was broken down into separate smaller shapes which informally spread themselves over the site” (Gebhard 1967:137). While many of the buildings contain elaborate detail, for the most part their exteriors of smooth reinforced concrete and stucco walls imitating whitewashed adobe walls present a somewhat austere expansive face. Offsetting this is the placement of elaborate interior patios and gardens for movement between classrooms, studious contemplation, and social interaction (Requa 1926; McAlester 1984:418) This attention to the arrangement of volumes and open spaces across the built landscape of the campus, with combinations of flat, hipped, and gabled roofs, gave the impression of the multiple and varied roof-lines of Spanish villages, or, in the case of San Diego State Teachers College, the “harmonious expression of learning and architecture” (Gebhard 1967:139; Hardy 1929:1). The college’s chief designer, Howard Spencer Hazen, worked in a style fusing Medieval Spanish Moorish, Jewish, and Christian architectural styles, know as the Mudejar (Bevil 1995:45). This style uses the horseshoe arch and the vault; in its native Spain it often includes wooden and ivory ornamentation. Metalwork and ceramic elements are also present, which can be seen in the example of the SDSU portales discussed below. 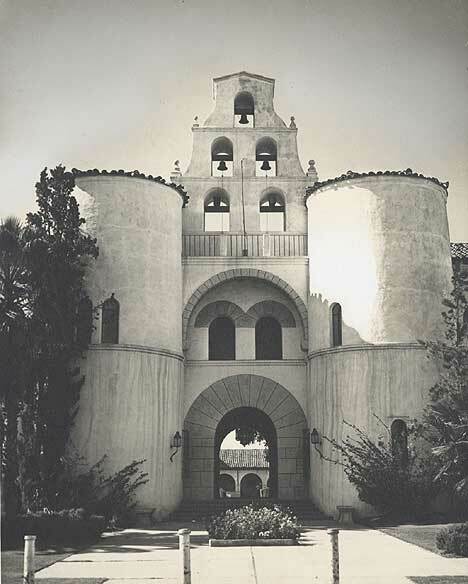 The driving force behind San Diego State Teachers College’s master plan was to create a campus that resembled a sprawling Spanish/Moorish university with arcaded walks and drought-resistant gardens. Situated on an isolated ridge overlooking Mission Valley, the campus took the appearance of a Mediterranean monastery built on a mountain to protect and shelter its occupants from the corruptive influences of the outside world. This “defensible space” metaphor can be seen readily in the design of the Administration Building’s portales or main entry (Figure 3.3). Figure 3.3 The portales of the administration building. Courtesy of San Diego State University Library, University Archives, Photograph Collection. Resembling a heavily defended bastide style entryway, two 2-story barrel-shaped turrets flank a Catalonian-inspired cut stone archway. Rajas (wrought-iron window grills) and ajimezes (concrete window grates) add to the entry’s defensive character. One of the most photographed buildings on campus, the portales’ most interesting feature is the Mission-style campanario (pierced bell tower) bridging the gap between the twin turrets’ red tile roofs. A noted architectural characteristic of Mediterranean and Spanish Colonial church architecture, SDSU’s campanario is very similar to those at Mission San Diego and at the Franciscan assistencia or sub-mission at Pala east of Mission San Luis Rey. It is speculated that the former may have influenced Hazen’s design (Bevil 1995:47, 56). Through the south entrance portales, a Moorish-style wrought-iron lantern hangs down the middle of a high ribbed arch vaulted ceiling. A band of turquoise glazed faience tile (azuelos) extends around the interior walls. Exiting the portales, a bead-trimmed stone archway opens out onto the landscaped courtyard of the original campus commons. Although bare at the time of the campus’ February 1931 opening, the commons’ original landscaping theme was to soften the stark white stucco walls through the use of foundation plantings and ornamental trees placed throughout the grass lawns. Conforming to the style’s passion for historical allegory, Mark Daniels chose specific plant material that would do well in San Diego’s hot, arid summer climate and heavy clay soil—conditions very similar to the Mediterranean’s mountainous littoral regions (Bevil 1995:47-48). 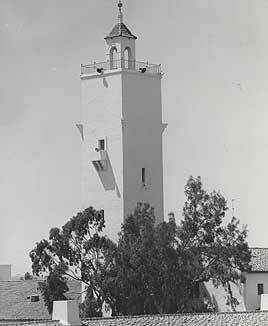 Figure 3.4 Hardy Tower as it appeared in 1959.Courtesy of San Diego State University Library, University Archives, Photograph Collection. However, even drought-resistant plants, along with students and faculty, get thirsty. Sanitary issues and fire protection also needed to be considered. The solution was the placement of a 50,000-gallon water storage cistern buried within the main quad area near the base of the Campanile. In reality a camouflaged water tower, Hardy Tower contains a 5,000-gallon water tank near its 200-foot apex (Figure 3.4). Electric pumps at the tower’s base drove water up from the underground cistern to the upper tank. The weight of the water and gravity then provided adequate “head pressure” for the campus water supply system (Bevil 1995:49). The Campanile also had an allegorical purpose; Hazen designed it and the adjacent Library Building to suggest a Spanish Roman Catholic church building and bell tower built by Moorish craftsmen. The building’s east wing, with its sheltered arcades and spacious courtyards, resembles the cloistered inner compound of Mission San Juan Capistrano. Such Mission era details as grilled windows, wrought-iron fixtures and weather vanes on tiled cupolas and hooded chimneys are found within this area of the quad. Both the adjacent Science and Training School buildings continue this architectural allegory. The diminutive patio within the former contains the “Banana Quad,” cared for by grammar school children and their student teachers (Bevil 1995:49-50). 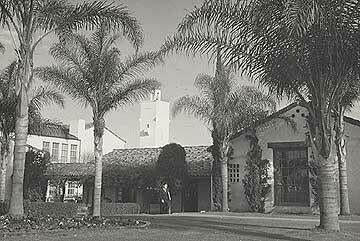 Scripps Cottage, originally located nearby the Campanile in the quad area in front of what is now Love Library, resembles a vernacular Spanish Colonial country house (Figure 3.5). University Library, University Archives, Photograph Collection. The result of a $6,000 donation by local benefactress Ellen B. Scripps, it served as the headquarters of the campus Y.M.C.A. and Y.W.C.A. organizations as it does today in its new location near Scripps Terrace and HilltopWay (The Aztec, 23 September 1931). North of the cottage’s original location was the Aztec Café and Bookstore (Figure 3.6), also done in Spanish Eclectic vernacular style (Bevil 1995:51). Figure 3.6 A view of the old bookstore with Hardy Tower in the background. Courtesy of San Diego State University Library, University Archives, Photograph Collection. Even the utilitarian Shop and Boiler Building located on the campus’ northeast ridge overlooking Alvarado Canyon were built in the Spanish/Mediterranean tradition. Housed within its “Shop Building Renaissance” design were the oil-fired boilers that provided heat throughout the buildings during the winter months (Bevil 1995:50). The last building that Howard Hazen designed was the monumental Women’s Gymnasium Building. Hazen continued the Mudejar-influenced design features by incorporating ventanas geminadas on the gymnasium’s south facade as he did on the Academic Building’s Admissions Wing. Spanish for “twin windows,” they imitate those found in many Iberian and Spanish Colonial-era buildings in Mexico. His signature work is the Gothic-inspired southeast entrance portico on the gymnasium’s southeastern corner with its floriated capitals supported by coupled columns. Another unique feature of the steel frame and reinforced concrete-constructed “earthquake-proof” building is its open garden patio court, with its central Moorish-influenced fountain, decorated entryway, and red tile covered loggia (Figure 3.7). Figure 3.7 The garden patio court of the Women’s Gym. Courtesy of San Diego State University Library, University Archives, Photograph Collection. Provisions were made for a swimming pool on the east side of the gymnasium; however the budgetary concerns caused by the economic depression of the 1930s prevented its completion. Only concrete bleachers, now covered up, and a wing off the southeast portico, since demolished, were ever built (Bevil 1995:51). In the midst of all of this building, the effect of the Great Depression was finally felt. Because of slow housing sales in the Bell-Lloyd/Mission Palisades Tract, the Bell-Lloyd Company (the college benefactor) abandoned the entire project in 1936, stifling San Diego State College's development. Luckily, there was a mechanism in place that would help continue the campus development into a stylized Spanish Colonial Revival-inspired educational complex: the WPA (Bevil 1995:51-52). The WPA or Works Progress Administration was a federally-funded program designed to provide work for a limited number of unemployed Americans during the Great Depression. Part of the Emergency Relief Appropriation Act of 1935, the WPA sought to provide employment by initiating projects around the country (Howard 1973). WPA-funded projects accepted skilled, semi-skilled, or unskilled workers, with veterans and the widows of veterans given first priority (Howard 1973:329). The only limitations were that one had to be an American citizen, 18 years or older, and that only one member per household could be employed at any given time. By the end of the program, between 25 and 30 million workers benefited from WPA projects. With their skills and self-esteem intact or increased, many later found jobs in private industry. The majority of WPA projects were in construction, with 75% involved in either the refurbishing or new construction of government buildings. The other 25% of funding was directed toward a wide range of projects, ranging from highway construction to the writing of books in Braille (Branton 1991:13). Control of the various WPA projects was given to the local municipalities in which they were located (Howard 1973). From its outset, San Diego's public and private leaders were instrumental in formulating and sponsoring projects that provided jobs which strengthened the city’s infrastructure. Of the 19,650 people on relief in San Diego County in 1935, all but 4,000 (who were considered too old or infirm) were eligible for WPA jobs (Branton 1991:23). Two years later, WPA-funded construction projects in San Diego were six times greater than elsewhere in the nation. San Diego County benefited greatly from WPA projects which left a permanent legacy of many fine buildings, structures, public art, and other projects throughout the county (Branton 1991:132). The WPA played an essential part in the building and expansion of San Diego State College through the depression years. Although many of the initial core campus buildings were constructed using funds that were allocated before the depression, by the mid-1930s the college did not have the means to facilitate the increase in its student population. The WPA-funded campus building projects helped President Hepner continue the expansion of the campus as it was initially planned by Howard Hazen, Mark Daniels, and Edward Hardy. The first project approved for funding by the WPA was the building of the Aztec Bowl football stadium (Figures 3.8 and 3.9). Figure 3.8 WPA workers digging the Aztec Bowl on February 1, 1936. Courtesy of San Diego State University Library, University Archives, Photograph Collection. 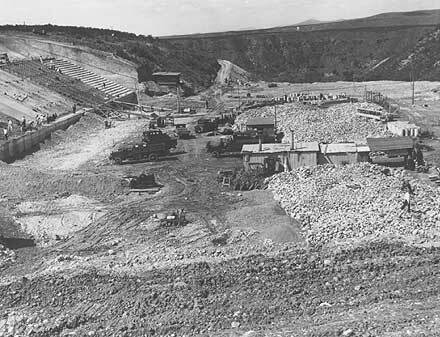 Construction on the bowl provided work for between 300 and 700 men. Dug out of a natural geologic depression, most of the work was done by hand and with mule-powered grading equipment. At the time of its completion in 1936, the cobblestone and concrete Aztec Bowl was the only stadium built on any college campus in the state of California (Bevil 1995:57). Other WPA-funded campus construction projects included the building of a columned arcade between the Academic and Science Buildings, classroom annexes to existing buildings, the Greek Bowl (Open Air Theater), and nearly 100 wood and concrete benches lining the walkways within the quads (The San Diego State College Aztec [SDSCA], 26 October 1932:1). 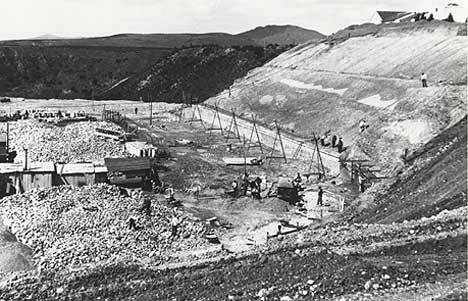 Figure 3.9 WPA workers digging the Aztec Bowl on February 1, 1936. Courtesy of San Diego State University Library, University Archives, Photograph Collection. Many lesser projects were also undertaken. Plans for a number of additional buildings and improvements were complete by the end of 1940. However, the need for national defense projects and the expansion of defense-related industries in San Diego after 1940 shifted much of the manpower allocation away from San Diego State (SDSCA, 3 March 1942:2). Only the Music Building and extensions to the Library and Science Building were completed subsequent to 1940 (Starr 1995:96). All three were dedicated on May 19, 1942 as part of the college's forty-fifth anniversary celebration (Bevil 1995:57). Support for the arts was also an important part of WPA-funded projects in San Diego County (Mehren 1972). Artist Donal Hord was responsible for sculpting "the Aztec" for San Diego State College. Sometimes referred to as “Monty Montezuma,” it is a brooding statue of an Aztec warrior cut from a single a 2.5-ton block of black diorite (The San Diego Union [SDU] 30 April:1). While the WPA provided funds for Hord’s salary, non-labor funding for tools and materials had to come from private sources. The San Diego Art Guild and several local campus student groups were among those who donated money. Five black and red cans were distributed throughout campus. On Friday, February 28, 1936, members of the Cap and Gown, Blue Key, and Oceotl societies made a final push for students to contribute ten cents each so that sufficient funds could be raised for the statue (The Aztec 26 February 1936:1). Hord and his assistant Homer Dana completed the statue in 1937 (SDU, 30 April:1). It was originally located at the entrance to the mall in front of Hepner Hall, and in 1984 moved to the south entrance of the college (DeLory 2002). Due to recent trolley construction, it is now located in the Prospective Student Center. The movement of “The Aztec” to make way for the new trolley line becomes a metaphor for the campus Historic District in general: adjustments must be made to accommodate the new. By the end of World War II, the Spanish Colonial Revival style had lost favor. While certain elements of the Spanish theme were incorporated into some of the buildings built between 1950 and 1970, the campus master plan has been continuously adapted and modified to accommodate new buildings on campus reflecting architectural styles currently en vogue. All of this produced a mélange of new buildings throughout the campus by mixing buildings of different mass, scale and architectural style (Bevil 1995: 52). However, San Diego State University’s historic core campus buildings have survived into the 21st century, representing a time of change and improvement which allowed a simple normal school to transform into a comprehensive, modern, distinguished university. 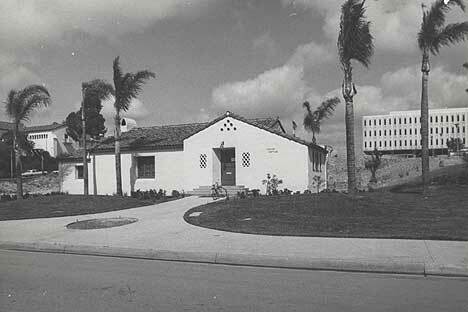 1995 From Grecian Columns to Spanish Towers: The Development of San Diego State College, 1922-1953. Journal of San Diego History 41(1):38-57. 1992 The Sacred and the Profane: The Restoration of Mission San Diego de Alcala 1866-1931. Journal of San Diego History 38(3). 1991 The Works Progress Administration in San Diego County, 1935-1943. Masters Thesis, San Diego State University. 2002 Aztec Statue Finds Home in New Prospective Student Center. Electronic document, http://www.sdsuniverse.info/story.asp?id=1869, accessed January 7, 2006. 1967 The Spanish Colonial Revival in Southern California (1895-1930). Journal of the Society of Architectural Historians 26(2):131-147. 1929 The New State College, In Which Bags and Bobs Will Blend with Historic Architecture. San Diego Magazine. September:3. 1930 The City Within. The Modern Clubwoman July-August. 1939 A Century of Public Teacher Education. Hugh Birch-Horace Mann Fund for the American Association of Teachers Colleges, Washington, D.C.
1973 The WPA and Federal Relief Policy. Da Capo Press, New York. 1981 Old Forms in a New Land: California Architecture in Perspective. Roberts Rinehart Publishers, Niwot, Colorado. 1947 San Diego State College, the First Fifty Years, 1897-1947. San Diego State College, San Diego, California. 1955 San Diego State College - Service and Leadership in a Growing Community. In The California State Colleges, pp. 50-59. California State Department of Education, Sacramento, California. 1984 A Field Guide to American Houses. Alfred A. Knopf, New York. 2005 Encyclopedia Britannica Online, http://search.eb.com.libproxy.sdsu.edu/eb/article-9056136?query=normal%20school&ct=, accessed December 5, 2005. 1926 Architectural Details, Spain and the Mediterranean. The Monolith Portland Cement Company, Los Angeles. 1968 Landmark Relocated. 24 September. 1937 Year of Work Required to Carve Aztec Statue. 30 April:1. San Diego, California. 1995 San Diego State University: A History in Word and Image, edited by Harry Polkinhorn. San Diego State University Press, San Diego. 1931 Scripps Cottage to Be Dedicated. 23 September. San Diego, California. 1936 Art Guild Starts Dime Campaign for Hord Aztec Statue. 26 February. San Diego, California. 1984 California’s Mission Revival. Hennessey & Ingalls, Los Angeles.